One of Americhem’s core competencies has always been weathering. 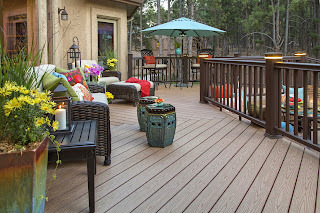 We help customers understand how their products are going to stand up to the elements, whether they’re used outdoors, like wood composite deck boards, or indoors, like commercial or residential carpeting. We’ve been at the forefront of weathering testing technology for polymeric products for decades, and we’re proud that we’ve helped establish some of the standard weathering tests that are used in various polymeric product industries. When it comes to weathering, Americhem has a deep knowledge base, and we’re always learning. That’s why the results of a recent long-term outdoor weathering study were very interesting to us. We believe the results urge some caution on the part of building products manufacturers when using accelerated testing as a predictor of real world weathering. Our researchers tested several polymeric compounds used in building products, including PVC, an enhanced PVC compound, some PVC blends and ASA. The samples were brown in color with lightness (L*) values between 35 and 65. Testing was performed by QUV accelerated testing devices with water spray capabilities (to simulated outdoor moisture/condensation exposure) in accordance with the ASTM D4329 standard. The length of the accelerated testing was 2,500 hours, which is a period determined to be most closely associated with a two-year outdoor exposure period. The outdoor testing was completed after two years at three sites representing three different climates: humid continental Ohio, humid sub-tropical Florida and arid Arizona. The exposed materials, both to accelerated and outdoor testing, were then compared to one another for each material. For PVC, with typically poor weathering performance, the samples weathered equally poorly in accelerated and outdoor exposure. Enhanced PVC weathered well in outdoor trials at all three locations, but accelerated tests showed much more color fade than the real world trials. So if accelerated QUV testing results were given significant weight, the material which performed very well in the real world might never have been produced. In PVC blends containing PVC and varying amounts ASA or acrylic, the correlation between accelerated and outdoor weathering was also quite weak. Additionally, the weathering performance was inconsistent between the three outdoor sites. We drew the conclusion that the materials in blends might not be fully compatible, forming two separate weathering phases. Finally, ASA was tested and found to be highly weatherable and well correlated between accelerated QUV testing and real world outdoor weathering. Enhanced PVC and ASA are good performers and superior to PVC and PVC blends in weatherability. Outdoor testing in end-use environments is vital, because accelerated weathering’s ability to predict performance is at least somewhat inaccurate. QUV testing results are more apt to be accurate with single polymer compounds. So, Americhem’s weathering experts are learning every day. The results of their work can have a big impact on the producers of polymeric building products, and we hope this insight can be of assistance to our customers. Americhem is working on a white paper which will be available soon that contains much more detail on this important study. In the meantime, to learn more about Americhem’s weathering capabilities visit our website.